Rice Krispies are my go-to cereal when it comes to making marshmallow cereal treats. The plain, puffed rice cereal is a near-perfect base for a coating of marshmallows and butter. But as delicious as they are, Rice Krispies aren’t the only cereal that you can use to make marshmallow-covered treats. These Lucky Charm Cereal Bars have a dose of colorful marshmallows for a cereal bar with a little extra sweetness. 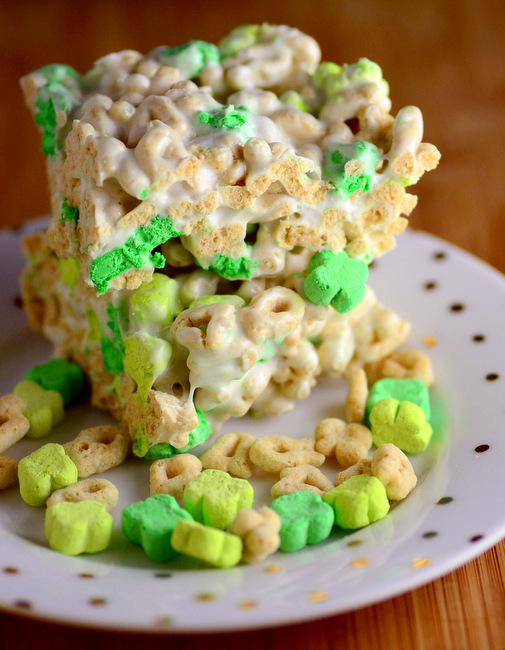 You’re going to need just a handful ingredients for these treats: Lucky Charms, Marshmallows, butter and a little pinch of salt.Â You’ll probably notice that my Lucky Charms only seem to have green marshmallows – and they do! 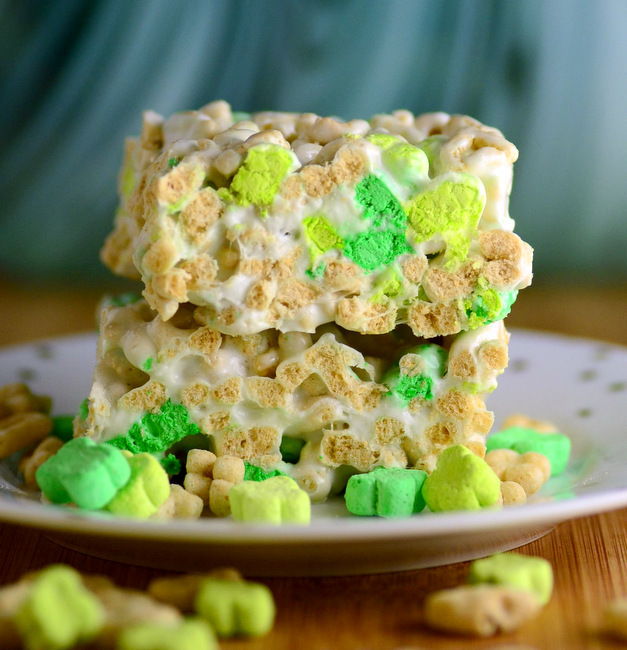 These cereal bars were made using a St Patrick’s Day edition of Lucky Charms cereal that contained two different colored clover-shaped marshmallows instead of the usual multi-colored assortment. To make the cereal treats, melt together the butter and marshmallows, then stir in the cereal and salt. Salt may seem like an unexpected addition, but a pinch of it helps to balance out the sweetness of the cereal and the marshmallows. If you’re a big salty-sweet fan, you can even increase it a tad. Since Lucky Charms contain marshmallows, you might expect them to melt when you stir them into the hot marshmallow mixture. While some of the color may bleed off the cereal marshmallows, they are actually freeze dried and do not melt easily. I regularly use freeze dried fruits in cereal treats and they work exactly the same way. Press the mixture into a square baking and and allow it to set up before slicing. Lightly grease an 8×8 or 9×9-inch baking pan. In a large, microwave-safe bowl (or a medium saucepan), melt the butter.Â Add the marshmallows to the butter and microwave on high for 60-90 seconds, until marshmallows have melted. Add the salt and stir the marshmallow mixture until smooth, then add in the cereal. Stir with a large spatula until everything is evenly combined. Transfer mixture to prepared pan and press down into an even layer with a spatula. Allow bars to cool to room temperature before slicing.